I would like to invite one and all to this year’s Hospice of CNY Fine Art Photography Show. This is the third year I was asked to produce this show so they must have liked the previous two shows. If you live around Syracuse, the FREE artist reception will be held on Wednesday, December 4, 2013 from 5:30pm to 7:00pm at the offices of Hospice of CNY (see banner below for the address. It is not far from the 7th North Street exits of Route 81). Refreshments and snacks will be provided. This is a great opportunity to see the works of some of the finest amateur photographers in our area. Here is a preview of what you will see. 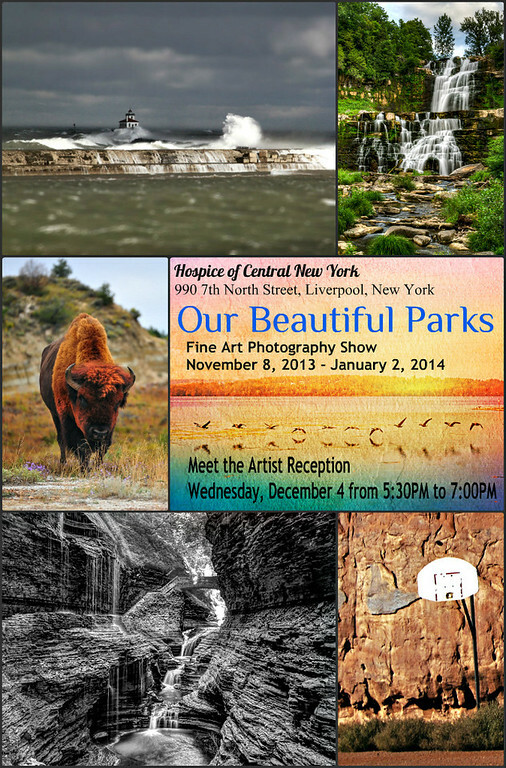 Our Beautiful Parks is the theme for this year’s Hospice of CNY Fine Art Photography Show on display from November 8, 2013 to January 2, 2014. This year I am accompanied by five Upstate New York photographers, two of which are new to the show, and presenting their beautiful park photographs. This created an excellent selection of subjects from national, state, local and county parks. NOTE: If you can not make the reception and would like to see the show, you may visit Hospice of CNY between the hours of 9am and 4pm, Monday thru Friday until the close of the show on January 2, 2014. This entry was posted in Photography and tagged beautiful, chittenango falls, county, free, harbor, Lake Ontario, lighthouse, liverpool, local, national, new york, oswego, parks, reception, show, state, upstate, watkins glen, wildlife. Bookmark the permalink. Wish I were closer. I’d like to see that!